The CT970-24 is an excellent choice for high-density WAN emulation. The CT970-24 is a set of 2 machines: One LANforge machine to do the WAN emulation and bridging, and an off-the-shelf managed ethernet switch supporting 802.1Q VLANs. The LANforge machine is a 1U rackmount and the 24-port ethernet switch is a 1U rackmount unit. The user's stations plug into the ethernet switch and speak regular ethernet (no 802.1Q VLAN support is required in the devices-under-test.) The WAN emulation, bridging, and optional virtual router configuration is all managed through the LANforge-GUI. This same general configuration can support 24, 96 and other amounts of WAN emulations: Contact your sales representative for pricing and configuration details. Connect Management ethernet port on the LANforge machine to Management network or management PC. If connecting directly to a PC, an ethernet cross-over cable should be used. Or, connect VGA, Keyboard, and Mouse to the chassis and manage it locally. Connect 802.1Q VLAN switch's trunk port to eth2 of the LANforge machine. This is the VLAN trunk between the LANforge machine and the VLAN switch. Connect port eth3 of the LANforge machine to your network switch or router leading towards the internet or network core. Connect Clients to the ports on the 802.1Q VLAN switch. Each port on the switch is configured to bridge regular un-tagged ethernet frames to one of the VLANs on the trunk port leading to the LANforge machine. Connect power to the units and turn them on. The order in which they are booted does not matter. The CT970-24 should now boot. If DHCP is enabled on the Management network, the CT970-24 LANforge machine will automatically acquire an IP address. If DHCP is not available, the IP address will be set to 192.168.1.101 by the LANforge start scripts. Start the LANforge-GUI on the management PC, or the CT970-24 LANforge server if managing locally, and click the 'Discover' button. It should find the CT970-24 LANforge appliance and add the IP address to the drop-down box in the Connect widget. Press 'Connect' and you will be connected to the CT970-24. Select the WanLinks tab in the GUI. One or more of the pre-configured tests should already be running. You may double-click the row in the top section to modify the configuration. You can also view a real-time report of the test with the 'Display' button. Any modifications take place immediately after you click 'Submit'. For a global view of the system and Virtual Routing features, click the Netsmith button on the Status panel or Resource panel. 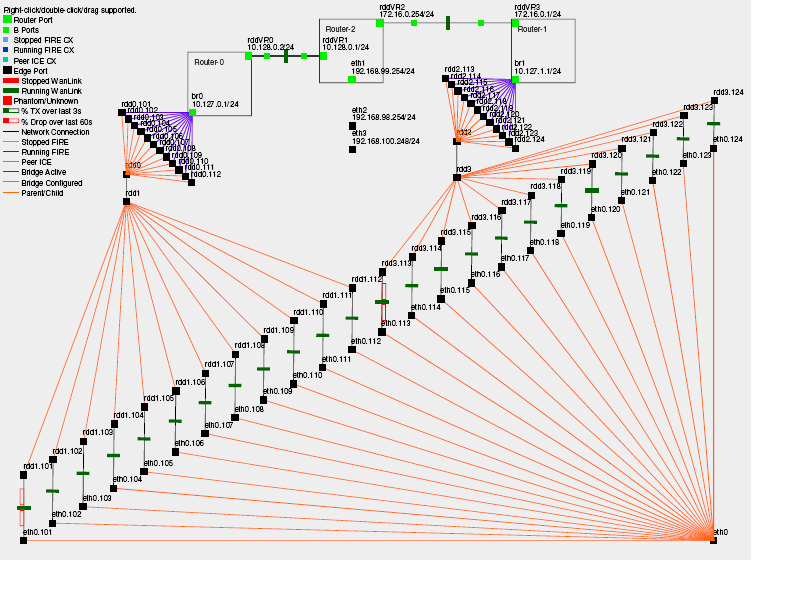 General purpose WAN and Network impairment emulator. Able to simulate 24 independent DS1, DS3, DSL, CableModem, Satellite links and other rate-limited networks, from 10bps up to 45Mbps (full duplex). Total aggregate throughput will not exceed 1Gbps. Can modify various network attributes including: network-speed, latency, jitter, packet-loss, packet-reordering, and packet-duplication. Supports Packet corruptions, including bit-flips, bit-transposes and byte-overwrites. Supports WanPath feature to allow configuration of specific behavior between different IP subnets, MAC addresses or other packet filters using a single pair of physical interfaces. WanPath support may require purchase of additional WanPath licenses, please ask your sales contact for more information. 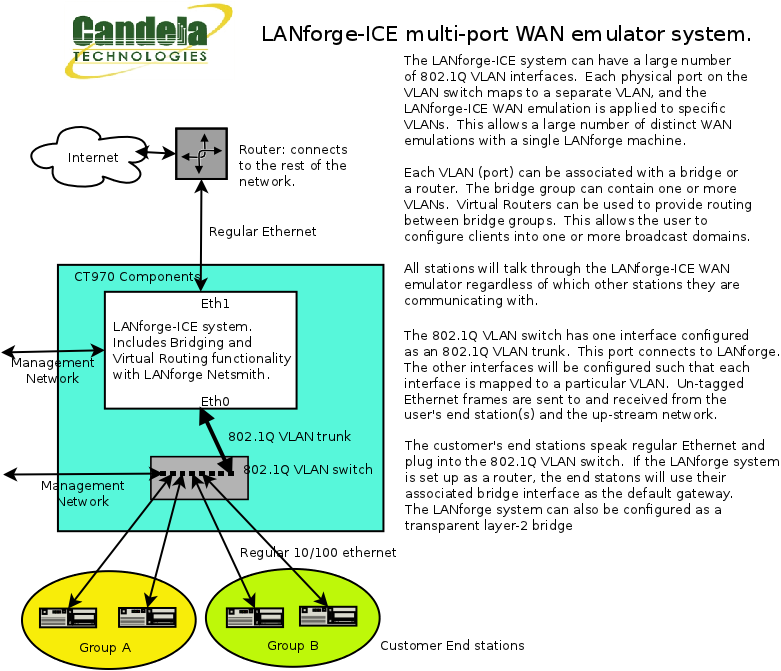 Supports routed and bridged mode for more flexibility in how you configure your network and LANforge-ICE. Supports WAN emulation across virtual 802.1Q VLAN interfaces more efficient use of limited physical network interfaces. Supports 'WAN-Playback' allowing one to capture the characteristics of a live WAN and later have LANforge-ICE emulate those captured characteristics. The playback file is in XML format, and can be easily created by hand or with scripts. The free LANforge-ICEcap tool can be used to probe networks and automatically create the XML playback file. Includes comprehensive management information detailing all aspects of the LANforge system including processor statistics, test cases, and Ethernet port statistics. Includes easy built-in scripting to automatically iterate through bandwidth, latency and other settings. Advanced programatic scripting over a TCP socket also supported and example perl libraries and scripts are included. Automatic discovery of LANforge resources simplifies maintenance and configuration of LANforge test equipment. 2.8 GHz or higher Pentium processor. 1 GB or more RAM. 40 GB or larger Hard Drive. 24-port 802.1Q VLAN switch with 2 GigE uplinks. 24 10/100 autonegotiating RJ45 Ethernet interfaces. 2 10/100/1000 autonegotiating RJ45 Ethernet interfaces. Dimensions: 17 x 8 x 1.7 inches (Standard 8-inch deep 1U rackmount) Metric: 432 x 203 x 43 mm.